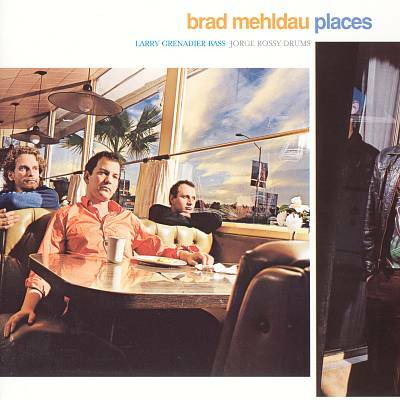 Places is an album by American pianist and composer Brad Mehldau released on the Warner Bros. label in 2000. AllMusic awarded the album 4½ stars and in its review by Richard S. Ginell, stated “the album is about the constancy of his personality and musical language, taking all of your personal mental baggage with you wherever you travel. This is an important album, one that anyone interested in piano jazz ought to check out”. On All About Jazz, David Adler noted “Each piece is named for a particular place (hence the title), which Mehldau attempts to represent in musical terms. In short, Places is a concept album, and a particularly effective one. For the most part, Mehldau holds his prodigious chops in check, preferring instead to conjure moods and memories with subtle nuances”. JazzTimes reviewer, Bill Shoemaker commented “In addition to being a technically dazzling pianist, Mehldau has an arch sense of nuance; by changing the touch of a single note or introducing a single beat’s rest in a long serpentine line, Mehldau can turn a smile or a frown upside down”.